Fans of comic legend Bill Murray are in for a special treat as VideOdyssey – Liverpool’s one and only VHS rental shop, will be showing an exclusive preview of ‘The Bill Murray Stories - Life Lessons from a Mythical Man’ as part of the Liverpool International Film Festival. Directed by Tommy Avallone, the documentary will lift the lid on the Ghostbusters star's legendary real life antics and philosophy of living in the moment. The film that will be shown at the venue on Saturday 10th November, explores the stack of stories that have surfaced in recent years about Bill's random acts of engaging with the public; from impromptu karaoke jams, doing the dishes at a student party or stealing chips from people and whispering in their ear: "No-one will ever believe you." Despite massively downplaying his antics, the Lost In Translation actor is well known for his impromptu acts – from photobombing wedding photos to sneaking into bars to bartend, he always leaves the public in shock. In this documentary we meet the people whose lives he's touched and inspired. Leaving you wondering - can't we all live our lives a bit more like Bill? Avallone doesn't have to look too hard at the performer's bio to tie his surprise appearances to his training in improv comedy with Del Close. Though it doesn't dig into his spiritual beliefs, the movie hints at them with a quote in which the actor says of surprising strangers, "It's what I'd want someone to do for me — just wake me the hell up." The movie has won rave reviews at festivals across the US with fans hearing some first-hand accounts of Bill Murray's mysterious sightings at locations around the globe as well as stories from best friends and close collaborators. According to Avallone in its film publicity: "The documentary features rare and never-before seen footage of the comedic icon participating in stories previously presumed to be urban legend. of the afternoon, Bill Murray lives in the moment and by doing so, creates magic with real people." In the trailer alone, we see Bill Murray showing up unexpectedly for a dodge ball game in the park and arriving to a private dinner without a reservation. There are a ton of tall tales told in The Bill Murray Stories: Life Lessons Learned from a Mythical Man, and apparently all of them are true. 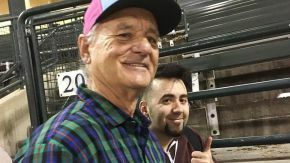 VideOddysey’s owner Andy Johnson said: “I’m a huge Bill Murray fan, he’s always been a role model to me from watching Ghostbusters as a Kid. “We can all learn a lot from Bill and how he leads his life, like not taking life too seriously." “When I heard about the documentary I had to get in touch with the director and see if he’d let us show it. You can see the trailer in our video box above.